Music heals – and Lyman Ellerman is living proof of the power music has to cleanse the soul from dark times. 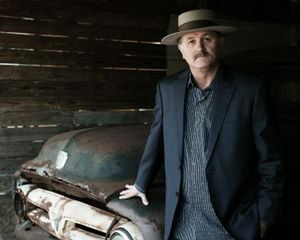 Walking the fine line between honky-tonk heroism and hand-sewn Americana, Ellerman measures his heart through his music, writing songs that reflect honesty and truth. “We need humanity so much more these days instead of judgement,” he says, and his songs are proof of that mantra, reflecting the rawness of grasping to understand life’s big questions and inspiring listeners to dig a little deeper themselves. Ellerman’s sturdy foundation of life experiences allows him to craft a cohesively somber project with his recent album, I Wish I Was A Train. A shining example of how dark times can often yield the most outstanding work, Ellerman twists his poetic grandeur into honestly grim reflections of addiction, loss, recovery and heartache. Throughout the album, Ellerman settles into a rather dark place and allows himself to feel each emotional punch, not afraid to share the intimacy and honesty of each life experience with his audience. Having cleansed himself of grief and heartache through song, Ellerman hopes his forthcoming music will showcase a different side, one of light and hope. “I’m still a firm believer that music should be used for good – inspiration, action, acceptance, healing, laughter,” says Ellerman, and his new music does just that. Without losing the sincerity of his previous work, Ellerman is writing songs that allow him to move forward with acceptance and turn a new leaf in both his personal life and his career. Favoring live performances over anything else, Ellerman is celebrating a little more, hurting a little less, and helping his audience do the same.